It’s officially the start of Fall and with that comes beanies, hot chocolate, crispy leaves and all things pumpkin spice. 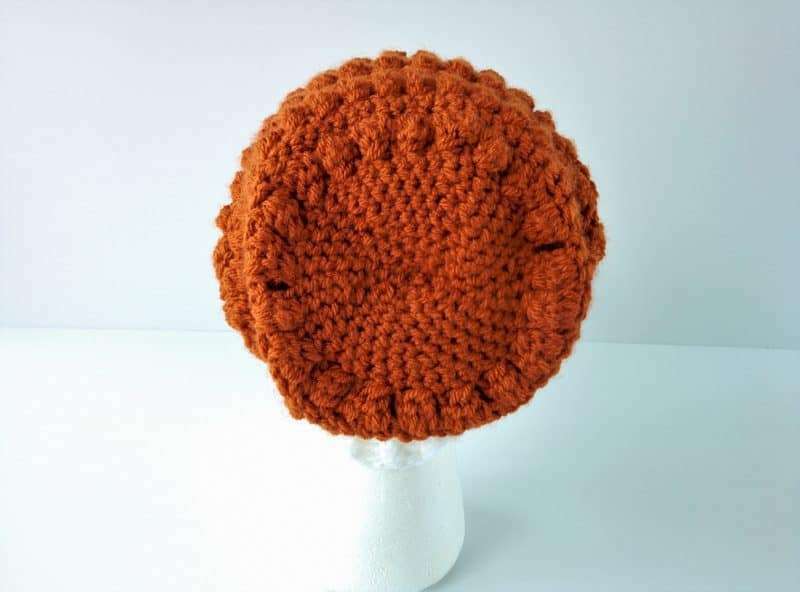 I’mt not a huge fan of pumpkin spice, but I do love that it means the seasons are changing and there are so many bright, earthy and deep colors to wear. 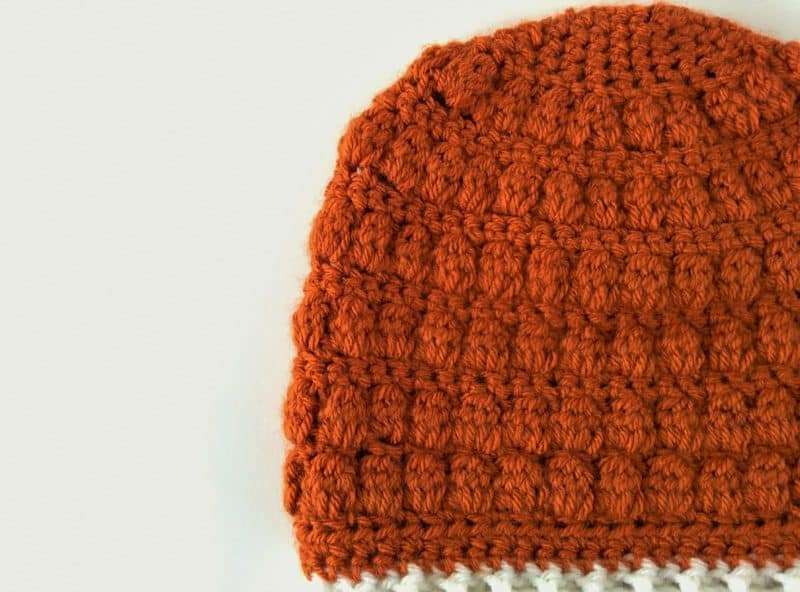 One of my favorite things about Fall is making beanies and today I’m sharing a very easy double crochet beanie pattern. 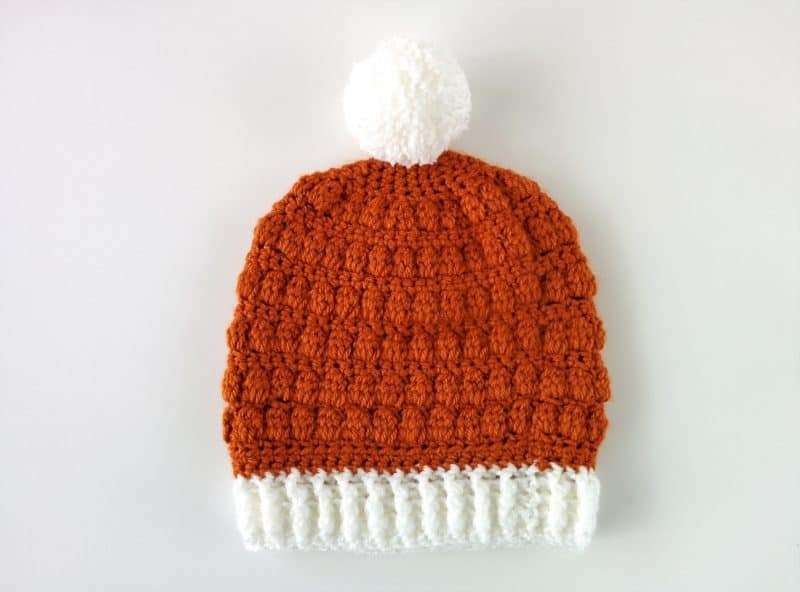 It’s called the Pumpkin Spice beanie because it’s perfect for the start of Fall and the color is a vibrant pumpkin orange, but it would also look so beautiful in other colors! 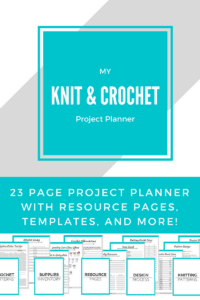 I’ve shared a few that you guys have made in different colors at the end of this post. Let’s get started! 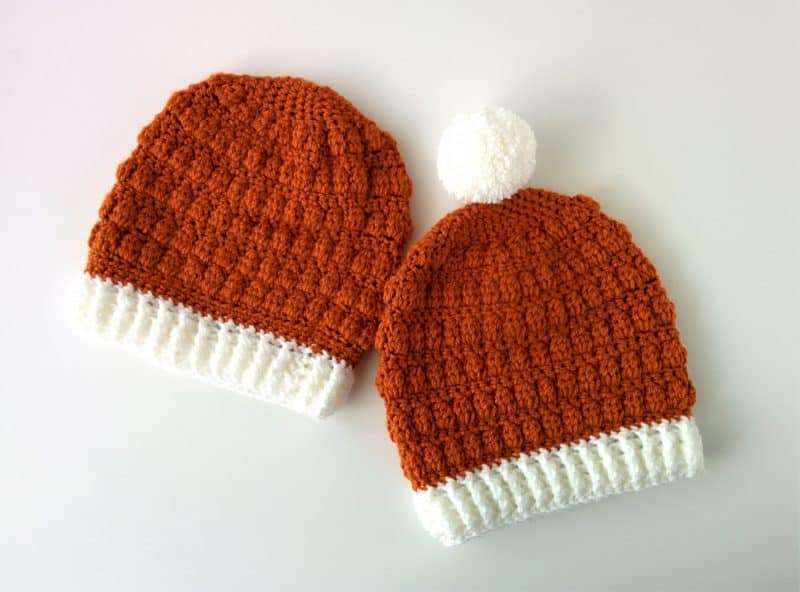 Beanies are great crochet projects for beginners. Sometimes, I think people struggle with sizing and getting the hat to fit just right, but that’s an easy problem to solve. I had the same struggle for years until I learned how to actually size a beanie and get it to fit every time. So I also created this handy guide to sizing hats so you can get a perfect fit whether you’re working top down or bottom up! You can get The Ultimate Guide to Sizing Hats for free here. 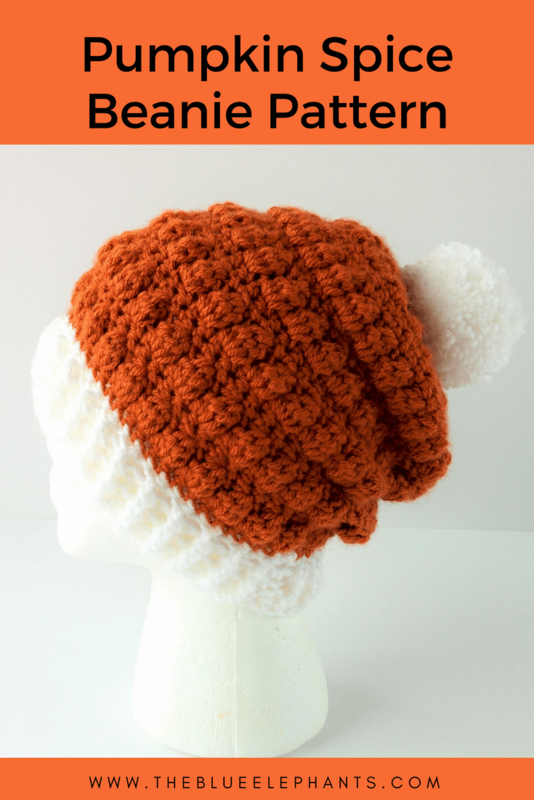 This crochet beanie pattern is worked from the bottom up. 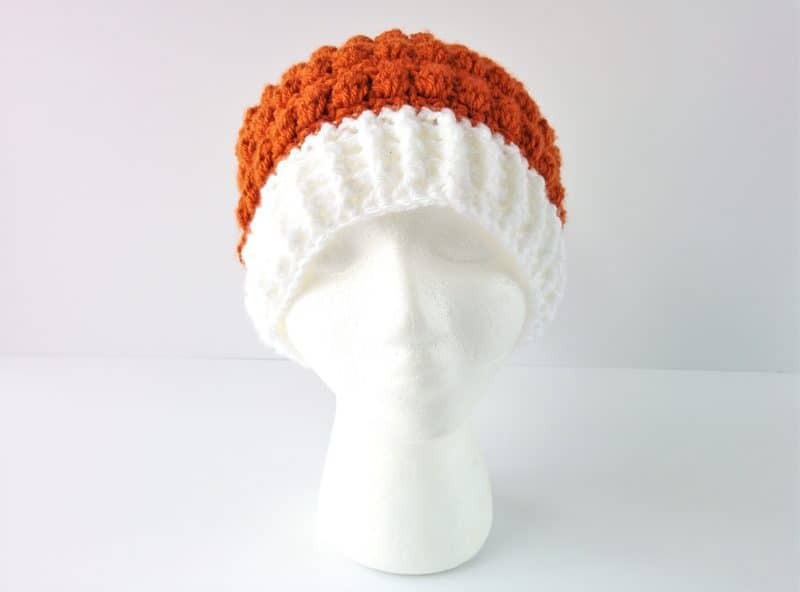 I started by using my favorite crochet ribbing technique to make a stretching ribbing in white, then I used my Burnt Pumpkin yarn to create the textured body of the hat. Then it was just a matter of closing the top and adding a fun pom! The beanie is a little bit slouchy as you can see from the picture below and it’s super easy to wear all Fall long. 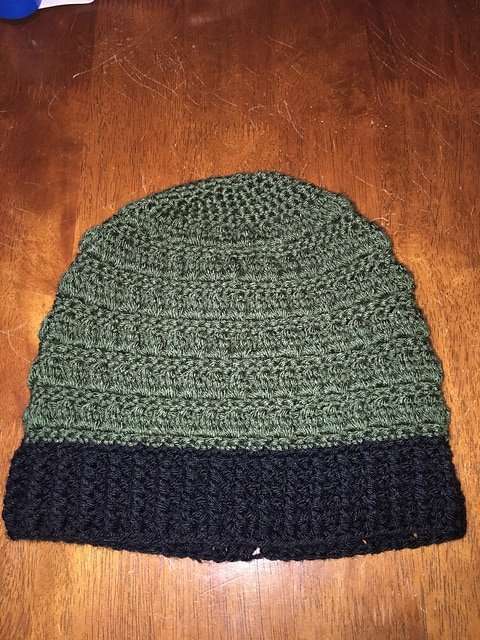 This pattern makes a beanie in a women’s small (20-inch circumference). The PDF also includes sizing for medium/large. Round 1: Using the white yarn, chain 4. Work 60 foundation double crochet, and do not count the original chain as a DC. To work a FDC, yarn over and insert your hook into the first chain you made. YO and pull through just one loop. This creates a chain. Then, yarn over and complete the DC as normal. Once you have 60 FDC, slip stitch to the top of the chain to begin working in the round and place a stitch marker. Round 2: Chain 3. *FPDC, BPDC* around. 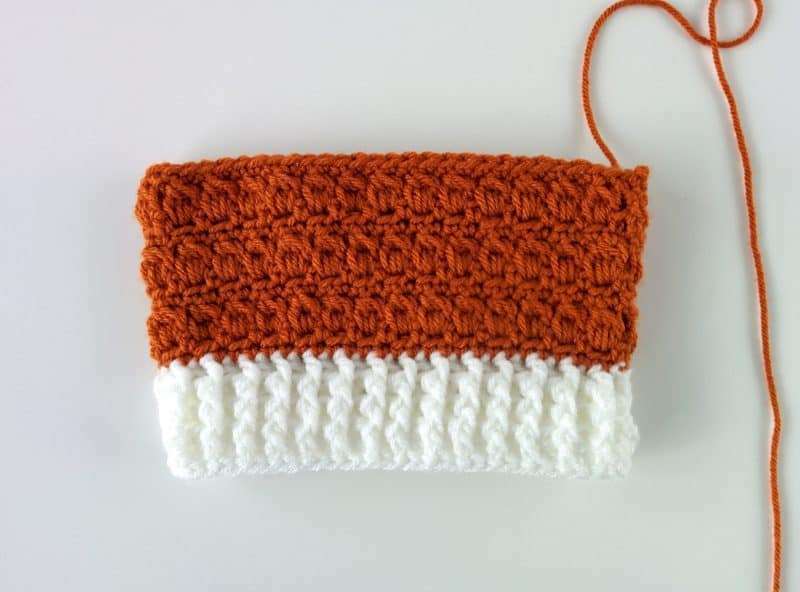 Slip stitch to the top of the chain 3. Rounds 3-5: Repeat row 2 for another 3 rounds to create the ribbing. 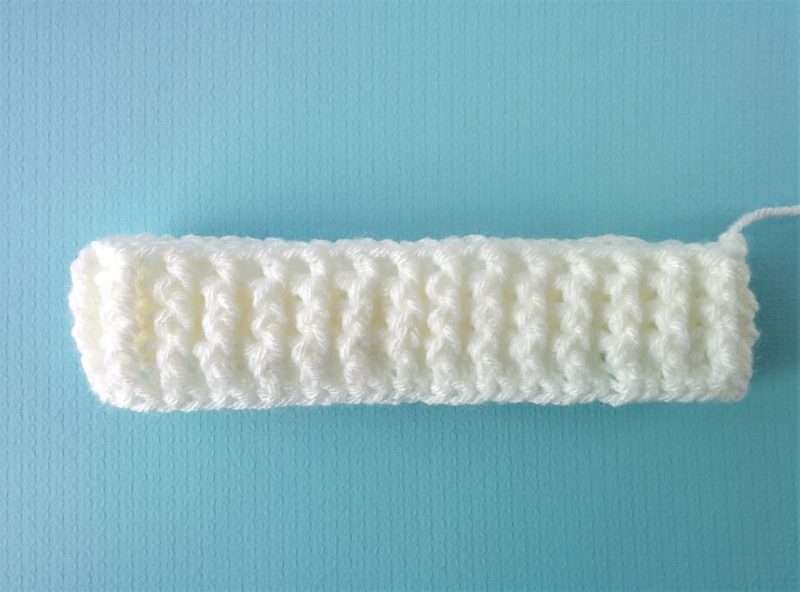 Watch this tutorial if you need some help with getting the perfect stretchy crochet ribbing! Round 6: Switch to the orange yarn, chain 1 and work 1 round of SC (60). Sl st to the chain 1 to finish the round. Round 7: Chain 1, SC in the first space. *Ch 1, skip one space, and SC into the next*, repeat this around and sl st to the chain 1. You have 30 chain-1 spaces now. Round 8: Chain 3. *Into the chain-1 space of the previous round, DC4tog, chain 1*, repeat this around and sl st to the chain 3 at the start of the round. You now have 30 puffs. Round 9: Chain 1, SC in each space around (60). Rounds 10-21: Repeat rows 7-9 another 4 times for a total of 5 puff rows. Round 22: Chain 1, SC in the first space. *Ch 1, skip one space, and SC into the next*, repeat this around and sl st to the chain 1. Round 24: SC 1 round (40). Now, work in continuous rounds. 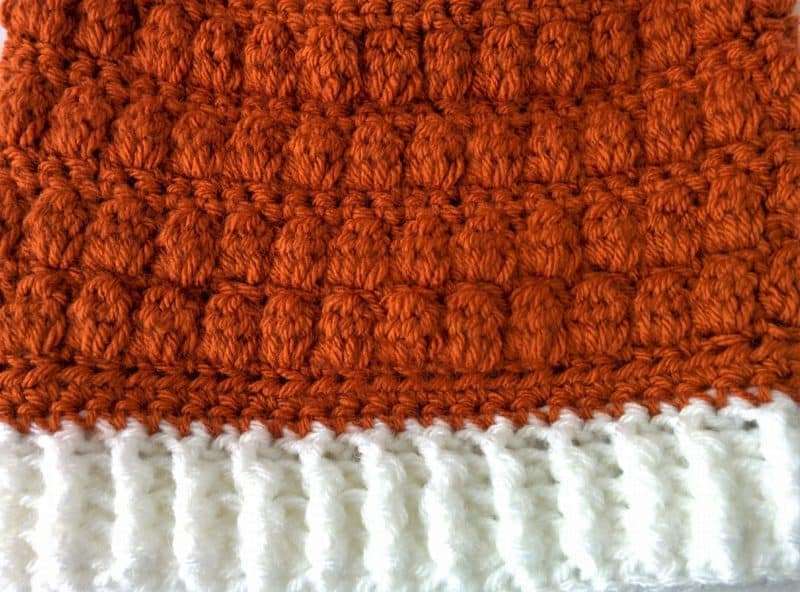 So don’t slip stitch to join each round. Round 31: Decrease round and bind off (5). Trim the yarn and thread the tail through a tapestry needle. 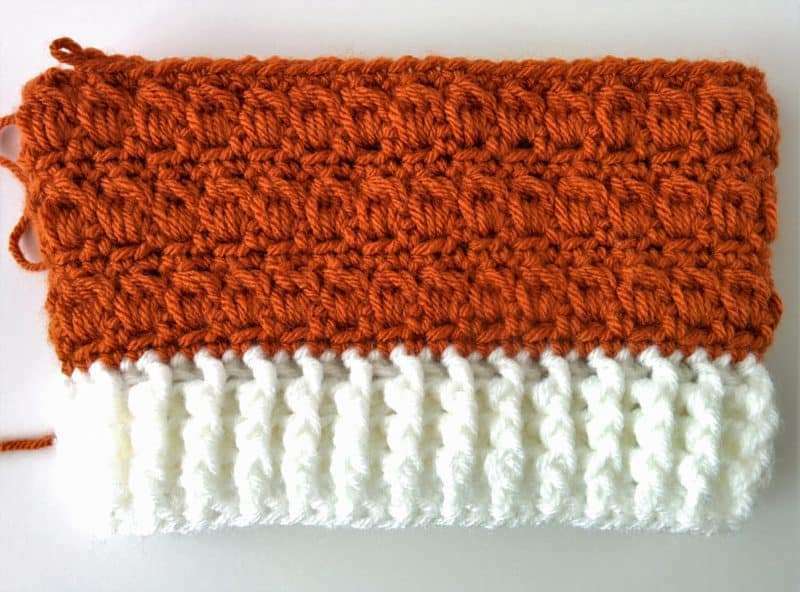 Run the needle through the front loops of the remaining stitches and pull to close the top of the pumpkin spice beanie. Secure the yarn, weave in the ends and trim any excess yarn. 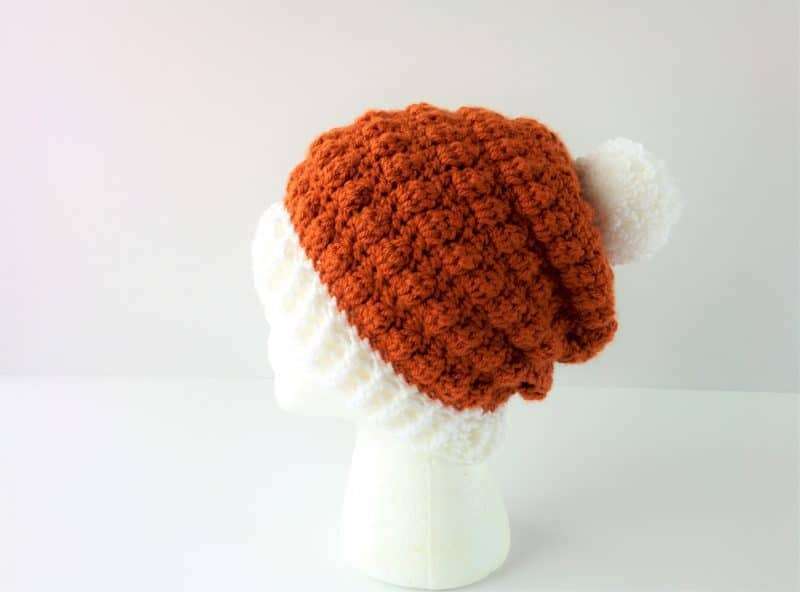 Now, just flip your beanie inside out so you get the textured puffs on the outside and you’re done. 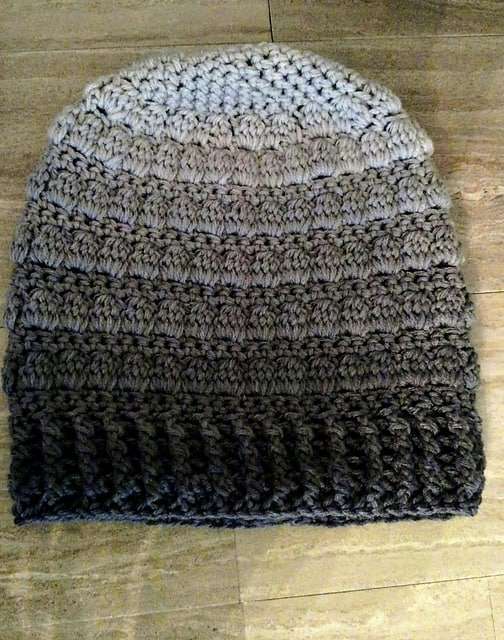 You can leave it the way it is but I much preferred the inside of the beanie where the texture was more pronounced. 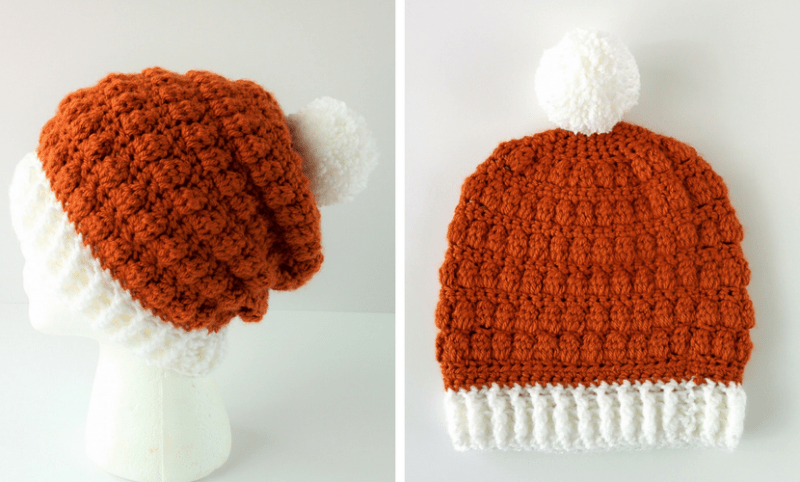 This crochet beanie pattern is reversible so you can wear it any way you like, but if you add a pom, pick which side you want to show. The first image below is before flipping and the second is after. 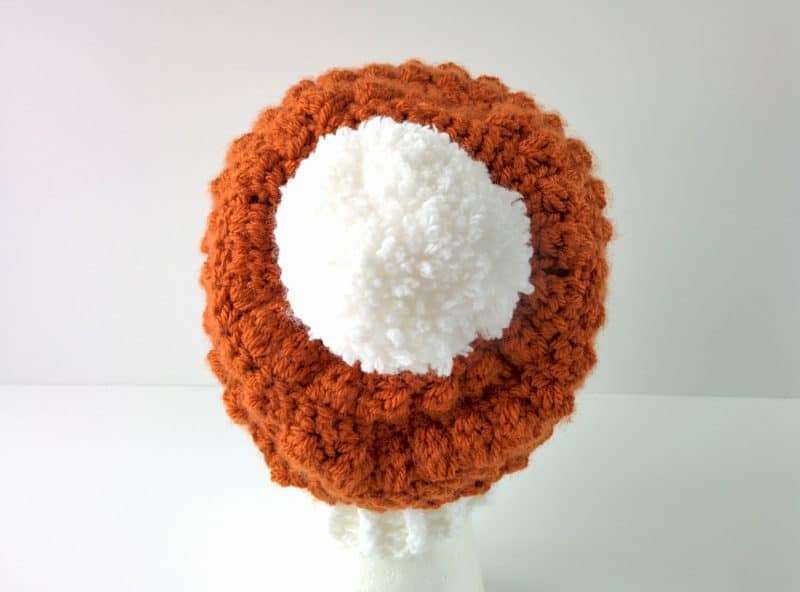 I used a medium pompom maker and white yarn for my pom. You can find out all about how to use the makers and get the perfect pom in a tutorial I did a few weeks ago. This is a small size, so don’t forget there is a medium/large size available in the PDF. Here are some of your recreations! I love the way this beanie turned out and I’m so excited for all the other beanies that will be released over the next few months. I hope you are too! 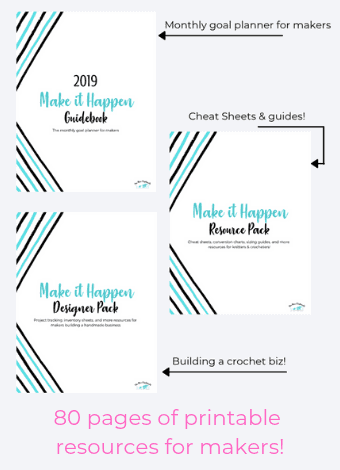 If you want to be the first to be notified of new patterns, shop updates and get freebies delivered right to your inbox, subscribe to the email list! Just fill out the box below and you’re done. Thanks! There will not be a video tutorial, but the main stitch is a DC4tog and you’ll easily be able to find tutorials for that on Youtube. Thank you, Lynn! It’s just the right pumpkin color, isn’t it? This is perfect for the season!! Thank you so much for sharing!! I’m glad you like it, Carol!